Busted! As technology increases and geeky backend coding geniuses work their magic, the time spent building a beautiful website has decreased so much in the past 4-5 years. Well, in saying that even the past 12 months the improvements for building a website has rapidly changed. The less time we are building your amazing website, the less you pay in $$$. Busted! This one is quite common…. These days pretty much everyone turns to the internet for answers. For example a potential client may search to find the menu or specials of a local restaurant, cafe or business before heading down to visit you. Having a web presence allows you to display this information and easily share these types of things through social media as well. Potential clients may also want to know exactly where you are located, having a website your clients will be able to pin point exactly where you are. Busted! If you want your business website to rank well in search engines especially Google, social media should be a big part of your future business plans. Google has made changes to how they rank a website and social media plays a big part in these rankings. You might say ‘yeah, but there’s so many’ I’m not saying spend all day building all your social networks, choose a few that are relevant to your business and learn to do them well. Some can be quite fun and creative to build. Facebook, Twitter, Google+, Instagram and Pinterest are an awesome place to start. At Jindy Web Design we can knock out a beautiful professional website in less than 48 hours from approval. We would call this a stage 1 website which is fully functional and will have a super professional look and feel. Your website will also let your visitors know who your are, what you do and why they should come to you. 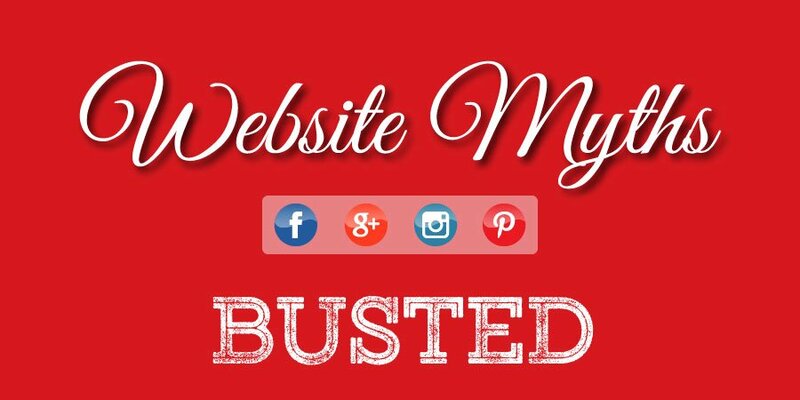 Most importantly to bust the million dollar myth… Under $500 for a stage 1 website. Contact us for more information, or to catch up for a coffee and a chat! Once you’ve got a solid professional base to work from you can then decide what to add to your site next. Stage building a website also helps keep within budget as we plan each stage and you know the cost upfront. Having a website is absolutely essential these days for businesses and is considered to be the ‘norm’ not having a website will create negative assumptions about your business whether you are a local business or not. Myth three: Social media is actually useless for business promotion for most businesses and a large waste of time. Serious businesses don’t sell through social media, and the costs this media charges makes it out of reach of most businesses. SEO and good websites is the best and only way to promote and sell on the net. How do I know this? Been doing websites and net marketing since 1994, and have seen everything that works and doesn’t. In response to ‘Myth one’ I had a chat with someone just the other who asked my if I could build them a website that they wouldn’t have to pay millions of dollars for. I was only using the million dollar mark as a figure of speech. A lot of people I have spoken to lately still believe creating a website is a really expensive project. ‘Myth two’ I agree, a lot of businesses do have websites, but I have noticed there are a LOT of businesses that still don’t have a website. These are more local businesses and I believe that having a website, even the most basic site will allow for the growth of their business. Thanks again Craig for your comments!